An original songwriter, Nick Krall names among his top influences such stellar writers and performers as : Kenny Loggins, Rickie Lee Jones, Paul Simon, Cat Stevens, Stevie Ray Vaughn, Paul McCartney, and Frank Sinatra. He may share some old Irish ballad with you and then touch your heart with memories from the ’70s or even the 60s and 50s. An evening with Nick is like a great campfire sing-a-long with an awesome sound system. Nick Krall has wandered through fields of bluegrass, folk, jazz, ’70s FM, praise worship, and Irish music.A 12-string guitar is the mainstay, but Nick may also treat you to some tasty mandoline or 6-string flat-top artistry. If he has a fault, it may be his insistence on a positive spin on life’s everyday abuses, but you’re going to be hard-pressed to leave not feeling good inside after his musical conversation with you. It might be surprising to hear him grab a handful of CSNY or Carlos Santana, but it is a pleasant one, gifting you with both the warm and familiar, or something new and refreshing, twists of melody and rhythm in his trademark musical stylings. 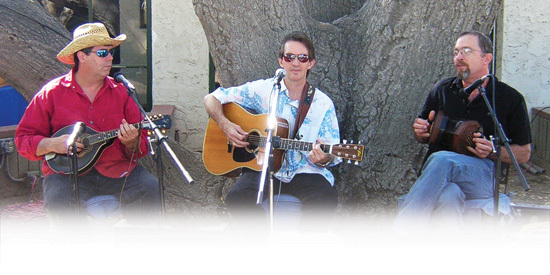 Fiddler’s Green : Nick plays with Chauncey Clarke, an accomplished singer, songwriter and instrumentalist, spinning musical tales from the British Isles and the Americas, using the 12-string guitar, the English Concertina, the mandolin and the pennywhistle. Chauncey has written some exceptional songs that are sure to delight. Where did that name come from? Fiddler’s Green is a mythical place, like Valhalla, where fishermen go when they die if they escape being sentenced to Hell. The sun always shines, the girls are all pretty, and bottles of rum grow on every tree. Nick and Chauncey will take you there. It’s well worth the trip. Nick’s newest musical adventures : L.A. River and Marv Rosenberg’s Safaris. L.A. River recently played at Republic of Pie in the NoHo Arts district and for the House of Blues Foundation at the craziest St. Patrick’s weekend celebration in Hollywood this March 2014. The Safaris premiered at the Secret Rose Theatre with two sold-out shows Sunday March 16, 2014. Watch for clips and videos of both. 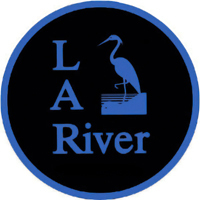 L.A. River is a country-rock band featuring original songs by lead singer Marcus Peirce. 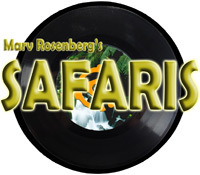 Marv Rosenberg’s Safaris is all about bringing a fresh perspecitve to doo wop. Its not all about the music. An accomplished actor Nick is persuing his life-long dream of gracing the silver screen. He can be seen here and there on various television shows and movies. Visit Nick’s IMDb page.